You know how I feel about you and I know how you feel. Last year we did a tribute to Matt. If you have never read it, you can find it HERE. We will not be posting tomorrow, as we are off to the reunion in Tampa today. Will have some catching up to do when we return on Monday. Some Tuneage to hold you over for four days...a smörgåsbord of genres - remember, it is always a great idea to hit the play button even if you do not know the artist...you can always stop it. Leonard Bernstein and the New York Philharmonic Orchestra performing "Ravel: Alborada Del Gracioso"
OK...totally stealing this from one of our new friends, LeeLee and her Kitchen Concerts blog. The day she posted this song, we had digitized the album and had listened to this like 3 times at least. From the Oakland Auditorium Arena, December 31, 1971, The Grateful Dead, "Mexicali Blues"
Birthday, Donna Summers, Grateful Dead, Matt, Muddy Waters, NY Philharmonic, Tampa, The Band, TKE. Happy 21st to Matt and have a safe and wonderful time in FLA Vinny. Cheers!! Happy Birthday, Matt! VInny have a fabulous time away! Great tuneage Bond. Looking forward to a fun time in Tampa. Happy Birthday MATT! And Vinny...have a lovely time with old friends and your new love! Have a great weekend Vin! I've always loved that photo of you and your son doing the "musical jam." Great stuff, wonderful memories. Happy Birthday to your Matt. 21 - WOW. Have a great time in Tampa, but don't forget to come back!!! Oh, and Ravel first thing in the morning? Cool! Oh and The Band and CCR are pretty much tied for my all time favorite 60's era band. Levon Helm is the man. Happy 21st, Matt. Maybe your dad will let me take you out for a drink now. Ah to be 21 again. Enjoy it Matt honey - it goes by faster than you think. Have a great and safe weekend honey (and make sure Nancy has a great time too). See you back on Monday. I love the baseball action shot. Hope you enjoy your reunion and Tampa! Don't forget the ORIGINAL Hooters is nearby in Clearwater! Happy Birthday to your son Matt and thanks for the tunes while your gone! Vinny - I just noticed your purple ribbon in the side bar. I am deeply touched and moved. Thank you, from the bottom of my heart. I remember the jammin pic!... he's grown into a fine young man. RWA: That is one of my keepsakes...back cover of the main newspaper. Canned Heat wasn't half bad either. HAPPY 21st MATT!! Wow, just a pup. Have a safe trip & wonderful weekend Bond! Just imagine how excited we were when our first grandchild was born 21 years ago and you will not have to imagine how proud we are of you today. You have grown in many positive ways over the last 21 years. You're charming (don't ever lose that smile), you're handsome (genes you know), you're caring, sensitive and very smart. WE LOVE YOU "JUST THE WAY YOU ARE"
Happy 21st Birthday Matt! We miss you and wish we were celebrating with you! Have a great day! FYI Mom Joan had her Pet Scan today and everything is great! Cheers! Time to celebrate! Have a great time in Florida. Be safe. Matt, Grab the world by the horns, but just remember to loosen your grip slightly when if tries to throw ya. Happy Birthday Matt!! 21 - YEOW!! Have fun and stay safe. Vinny, have a great time here in the Sunshine State.. Happy birthday to Matt! Have a excelant trip Vin!! No time to listen right now, sad, but true. I'm reading the list of tuneage, love that word, and thinking WOW! 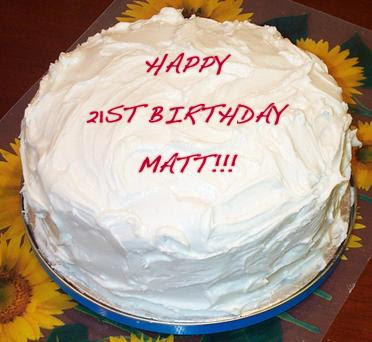 Happy 21st Birthday Matt :) I see you are loved, that's a good thing. Very nice pictures. Hope you are loving life in Tampa! Happy Birthday to Matt. Very nice post. GANG: TY Fl was fun...Matt survived! I'm like a week late, but I wanted to wish Matt a Happy Birthday! He's such a handsome young man! Just like his Daddy!! !